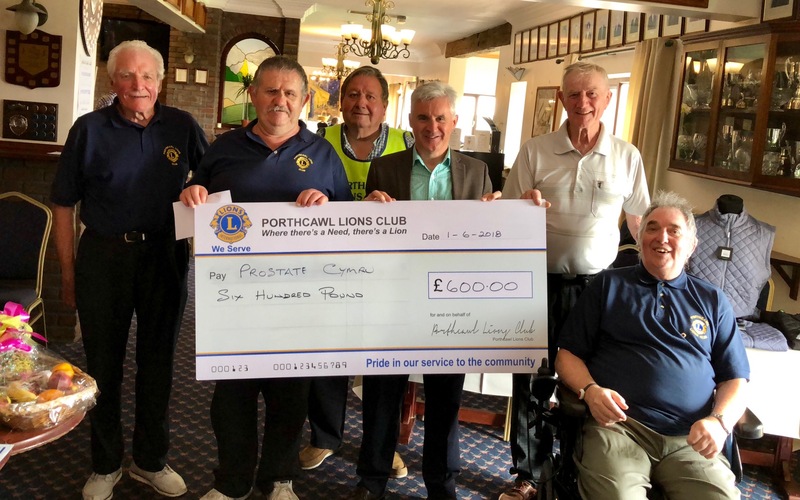 The Porthcawl Lions Club held their annual charity golf day at The Grove Golf Club in Porthcawl on Friday 1st June for Prostate Cymru, Sandville Help Centre, Porthcawl Stroke Club and Porthcawl Museum. This is an annual show of support for the charity by Porthcawl Lions for which we are very grateful. Golfers enjoyed the sunshine for their competition and helped raise £2400 which was split between the four charities with each organisation receiving £600. Prostate Cymru’s Chairman Andy Thomas accepted the cheque on behalf of the charity. The winning team was South Wales Police (team 1) with 106 points closely followed in second place by The Greys and in third place, South Wales Police (team 2). In the Ladies section Christine Eynon’s team won the prize. Brian Thomas was named the Porthcawl Lions Individual Winner. The prizes were presented by the Mayor of Porthcawl Councillor Norah Clarke.